The Junior League of Washington’s annual Tossed & Found rummage sale has achieved a number of significant milestones in its 27-year history – all to support the League’s work to improve our community and empower and equip women to lead. In 1993, the JLW Board of Directors organized the first Tossed & Found sale, netting more than $17,000. Five years later, in 1998, Tossed & Found netted more than $50,000. By 2005, that number grew to more than $100,000. The Community Cash Card project was started in 2008. To date, the League has donated over $40,000 worth of merchandise to community partners and individuals, directly supporting a local need. Tossed & Found grew its “green” initiative in 2009. As part of that effort, the sale continues to reduce materials brought in for the sale; is thoughtful about marketing materials produced; reuses shopping bags, hangers, and other materials; and recycles (or “freecycles”) unsold merchandise to local charities. 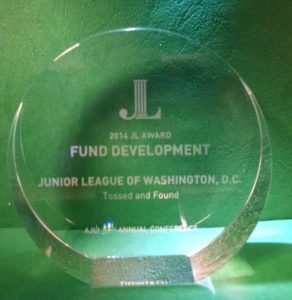 In 2014, the Association of Junior Leagues International, Inc., (AJLI) recognized the success of Tossed & Found by awarding JLW its top fundraising honor, the Junior League Award for Fund Development, which recognizes exceptional fundraising programs and campaigns that enable Leagues to operate effectively and to support their community impact and membership development initiatives. In 2015, Tossed & Found celebrated a record-breaking year by raising more than $158,000 and reached the milestone of raising a cumulative total of more than $2 million over its history. The 25th annual Tossed & Found sale took place in 2017 and surpassed the previous fundraising record, raising more than $180,000 total.